New loft, bright, friendly ... just to feel good for 1-4 persons. Beautiful bright studio apartment in a prime central city location for 1 - 4 persons. 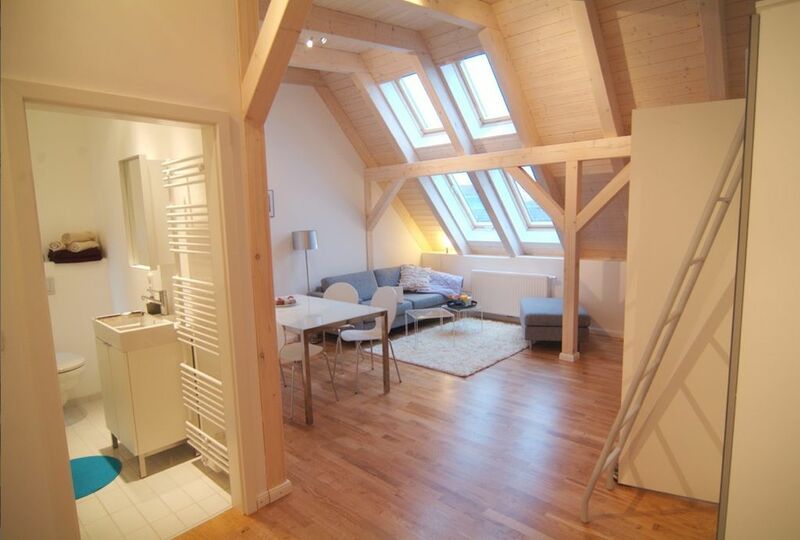 The apartment is located in one of the most beautiful parts of Hamburg in a beautiful and quiet side street. 5min walking distance from the Hills district. The U- and S-Bahn, the city bikes and taxi stand are only 2-5 minutes walk away. Cafes, bars and restaurants are nearby. Arrive and feel good. The 44sqm large apartment features a bedroom, a gallery, a living-dining area combined with a fully equipped kitchen and bathroom with window. The gallery is reached by a ladder from the living area and offers sleeping accommodation for 2 people. In total floor area oak floor has been installed. There are public, free parking in the street and in the surrounding area. Our family of 4 spent 8 days in Hamburg and this apartment was great. The owner Patrick was attentive and made sure we were settled. Location is on a family residential street with grocery store close by for essentials. We would definitely stay here again...or at Patrick other rental apartment. Patrick asked if we would be willing to move for their scheduling / cleaning benefit after 4 nights stay. The second apartment was right across the hallway. It was larger (Patrick waived the extra fee approx. $50/night more cost). However, for 4 adults the extra space was nice. The second unit did have a second bedroom, a balcony and slightly larger kitchen area ...all nice for a family of 4 adults. You cannot go wrong with either of these apartments! Both apartments were exactly what we had hoped for! Wir haben uns sehr über eure gemütliche Ferienwohnung gefreut und uns hier sehr wohl gefühlt. Bei eisigen Temperaturen vor der Tür war unser warmes Nest über den Dächern von Hamburg ein schöner Ort zum aufwärmen und die Seele baumeln lassen. Es hat uns an nichts gefehlt und die Anbindung ist echt klasse. We're really torn about the "star rating" on the review! We had stayed in this gorgeous apartment for a week and it is wonderfully located next to markets and transportation. Fortunately, we're in good physical shape for our age (60s) as there are 5 flights of stairs to climb to reach the loft apartment. Some of the constructive recommendations: it would be helpful to have an instruction sheet with all the information provided (internet/password), keeping the windows closed when leaving, recycle info, etc. instead of a few notes scattered around. There is really not much storage space for clothes as many of the bins were filled with bedding for the loft bed (we did empty the bins and store the bedding in the unused loft space) as well as the shelf in the bedroom. This is only for people like us who would be staying more than a weekend. Patrick (owner) was so helpful in explaining the washing machine workings; he also helped with restaurant recommendations. Again, this information would be great if it were included in an "instruction sheet". The apartment did have a few basics but no cooking oil; did have sugar and salt/pepper and a few other spices. Again, this is such a beautiful apartment we struggled with the star rating--we'd give it a 4-star rating if we were "weekenders"! We will create a central Instruction sheet as soon as possible. Regarding storage we will ask further guests because since five years we provide these setup up of two wardrodes and one shelf and we have lots of visitors which stays longer as one week even as family. (Of course the shelf should not filled with bedding). A bigger or another shelf could be a good idea. sehr nahe der U-Bahn Station, alles erlaufbar. Das mit der Schlüsselübergabe war auch sehr interessant. Eine modern gestaltete und doch gemütliche Wohnung. Die Treppe sorgt für den täglichen "Frühsport". Sehr ruhig gelegen. Durch die Nähe zur U-Bahn ein idealer Ausgangspunkt um Hamburg zu erkunden. The apartment is located in the center of Hamburg, one of the most beautiful streets. Quiet, yet surrounded by numerous restaurants, bar's and shopping. The trendy, the jump is not a 5 minute walk away. To city or state to the exhibition center is also about 5 minutes by train. The subway is located 200m. The Alster is ideal for walking and the Reeperbahn with its bars and theaters is 2 km away. The Elbe and the warehouse district is approximately 3 km away. From here you can explore Hamburg without a car.